Basswood back side: The back plate use basswood, which is heavy high strength corrosion resistance, with low frequency, high frequency, sound rounded and graceful. Great originality: The scroll is simple but fashionable, edge polished smooth, dustproof and anti-oxidation, keep the knob clean for long time. Good quality: Relying on meticulous workmanship through many processes, seriously polished, clear texture, natural air drying molding. The stability and life expectancy improved significantly, not easily deformed, high strength sound tension. Full-size 41 inch dreadnought body for full and vibrant tone, suited for all styles of music. 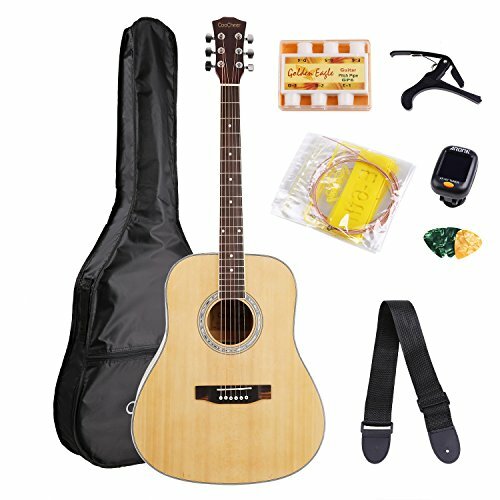 Comes with gig bag, guitar strap, guitar capo, strings, digital clip-on tuner , polishing cloth and guitar picks. Fully enclosed piano button,natural smooth finish. High quality steel string, five line hemming barrel, solid wood neck, no need worry about it will be broken. If you have any questions about this product by COOCHEER, contact us by completing and submitting the form below. If you are looking for a specif part number, please include it with your message.